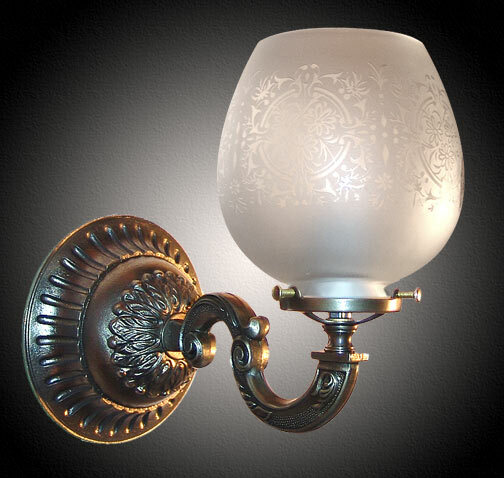 A beautiful imported acid etched French Brandy Glass adorns this cast brass single. Projection is small enough for halls but still bold enough to make a statement. Classic and elegant with ornate back plate and mountable upwards or downwards. Want a larger different glass shade? No problem! We’ll build it with a larger holder! Shown in Antique Brass. Available in different Metal Finishes, different Glass, Back Plate, multiple arms and many other Custom Options. Width 5 In. / Projection 8 In. / Depth 8 In.